This (almost) seven month old works hard! It seems like it’s been forever since we’ve taken Noah to occupational therapy. But it gets every more fun. Noah’s occupational therapist told us during his visit today that our little boy is now strong enough to have his occupational therapy visits upgraded…..to once a week, every week! It sounds like a lot (and it is) but as I’ve said a million times, we’re so thankful for all of the therapies available today to help children born with Down syndrome reach their full potential. I’ll never forget a few weeks after Noah was born when a representative from the Down Syndrome Guild of Dallas called me to help us get connected to our local Down syndrome supportgroup. At first, I was taken back by her quote, but it quickly occurred to me that she was right. There are many institutions that have dedicated their research on helping increase cognitive function for children born with Down syndrome. Today the focus isn’t on trying to “cure” Down syndrome, (there isn’t anything to cure by the way) instead it’s committed to helping children born with that little extra chromosome become all that God has designed them to be….and I like that. So to quote my friend from our local support group, there really hasn’t ever been a better time to be born with Down syndrome! 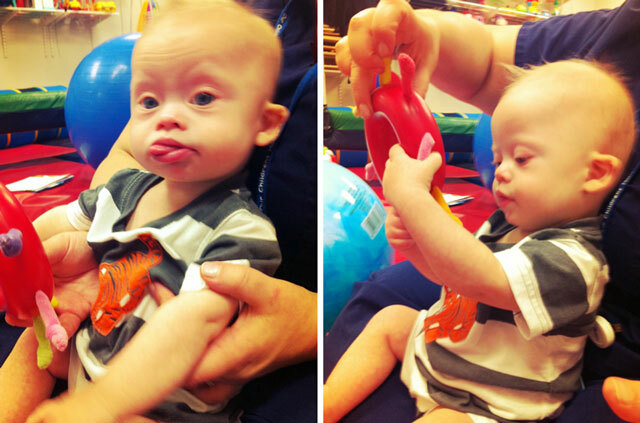 I’ve learned so much about the many significant advances in Down syndrome research over the last seven months since Noah has been born…and I’m always looking to learn more! I just discovered your blog and its a wonderful story you are sharing. So many parents can find great support in Noahs Chronicles. Thank you for sharing! So glad that you found us. Look forward to getting to know you and your family as well. Oh Noah is such a cutie pie! Those eyes!